Chapters Indigo has some great deals online for Black Friday and they also have their biggest Black Friday Event ever in-store! 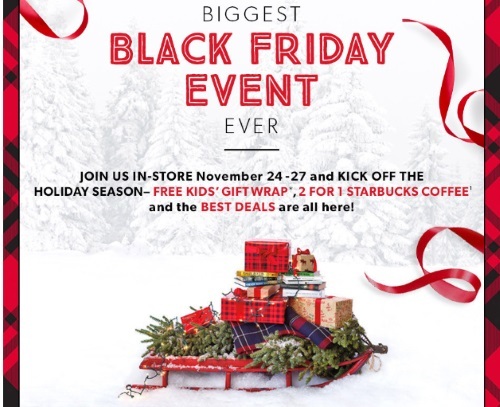 Join them in-store and kick off the holiday season with Free Kids Giftwrap (with kids purchase) and 2 for 1 Starbucks coffee and the best deals are all there. Pick up coupon in-store and buy a Starbucks Grande handcrafted Holiday Starbucks beverage and receive one of equal or lesser value for free. Coupon can be redeemed at Starbucks stores located at Chapters and Indigo and participating Starbucks stores in Canada. Coupon must be surrendered at time of purchase. 20% off select LEGO (Thursday - Sunday, in-store only. Offers are valid November 24-27, 2016.